The 2010 championship, which was held in Kazan, Russia between July 5 and 10 saw participation of 13 men's and 14 women's teams from 9 countries, representing their universities. Right after the finals, the medal and prize giving ceremony took place on the center court, followed by the closing ceremony. In the beginning the officials greeted the referee team and the volunteers who helped the athletes on the courts. The women's medal ceremony was held by Director General of the Kazan 2013 Executive Board Mr Vladimir Leonov, EUSA CT Chair Mrs Daniela Erni and Russian representative on the FIVB Council Mr Ilya Volodarsky. Amid camera flashes and applause they presented three best women's tandems with the cups, medals and commemorative diplomas, with the Russian tandem of Victoria Rastykus/Daria Yarzutkina from the Moscow Institute of Business and Law topping the podium. President of the Russian Student Sports Union and EUSA EC member Mr Oleg Matytsin, EUSA representative and EUSA EC member Mr Leonz Eder and Counselor-minister of Education and Science of the Russian Federation Mr Nikolay Plotnikov honored the men's winners. 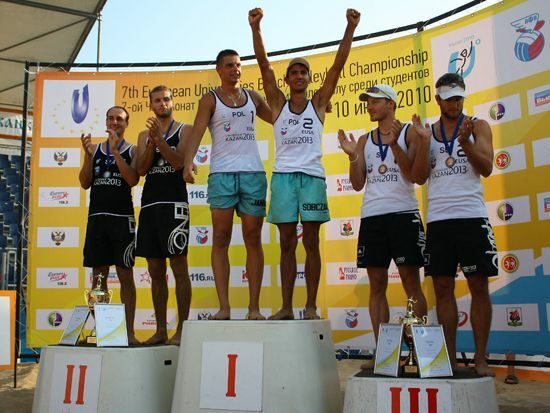 Sebastian Sobczak/Piotr Janiak from the University of Lodz claimed the top spot on the podium in the men’s competition. Mr Matytsin expressed his gratitude to the Kazan 2013 Executive Board, the Kazan City Hall and other ministries and departments that had been involved in the tournament management. Mr Eder congratulated all the delegations for their participation and their performances and made a special note of the volunteers' contribution to the Championship in his speech he made in Russian. At the end of the closing ceremony, the EUSA flag was handed to the students of the Malaga University, hosts of the next year Championship. 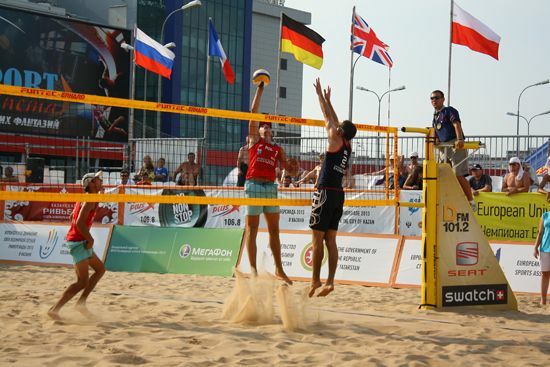 For results, photos and more information about the event, please see the official website of the event at http://s-kazan.ru/volleyball/.